When searching for a casino party provider you will look at so many different companies you may get a bit confused! You may also be mislead by a slick salesman!! Salespeople tell you what they think you want to hear, not what you need to hear. When I was younger, I remember being corrected by sales managers when I tried to look out for the customer a little “too much”! I like to give the customer an honest product. 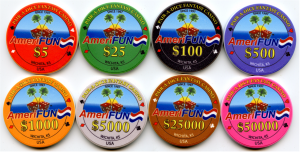 Don’t regret booking with another provider; no one knows the game like Amerifun! 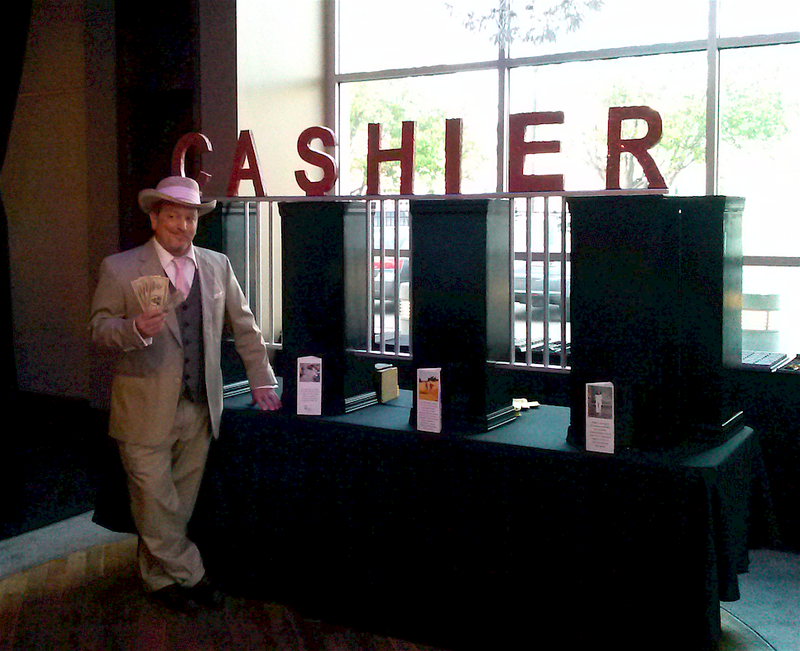 We have been in business since 1997 and have the hard-earned knowledge to ensure the total success of your event. Your detailed proposal will include photos and itemized costs for each item. There are no stains on our tables since they are all covered in clear vinyl. If a drink spills, it will indeed ruin the cards; but on a cloth table a wet spot will persist on that table for the duration of the evening (and a spillage will occur 100% of the time if alcohol is involved!). We strive to impress you, take pride in our self-fabricated equipment and enjoy the reward from delivering Las Vegas to you! Every table has something special!! If you need dealers, our staff is HIGHLY-SKILLED and we currently have no “newbies”! Ours is a select group of hand-picked event-tested lively staff who enjoy what we do. And don’t be intimidated, we want to teach you the rules if you do not know them. 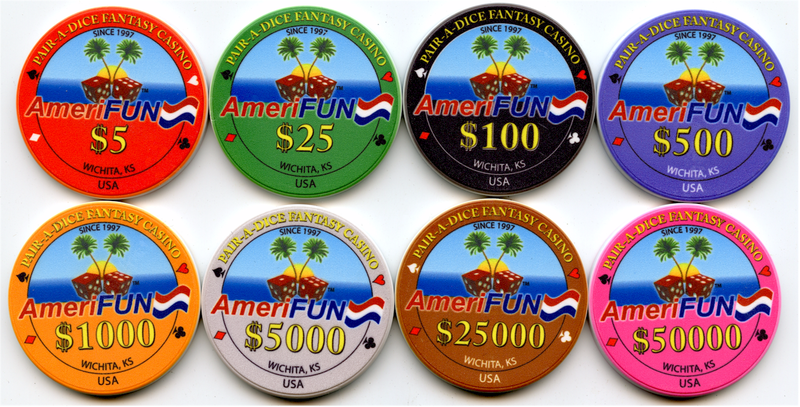 We offer “fun rules”, “loose odds” and trivia… because everyone wants to feel like a HIGH ROLLER! But at the same time we will provide a challenging and fair gaming session. We include all the tools in an easy format. Free play money (fun money) and prize method included. 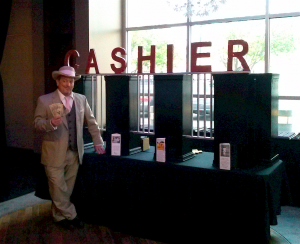 Cashier Cage also available. We offer training for your dealers and we “have it down!” Training takes about an hour for moderately-sized groups and two hours for larger groups. Our chips are the best in the business and INCLUDE DENOMINATIONS which provides for no guest confusion on knowing what’s what. We have served clients that have used all of our competitors, “much better production” or “way better equipment” is what we hear the most! Also, we keep our clients..(there’s no reason for them to look elsewhere!). Give us a try and see! References available on request. 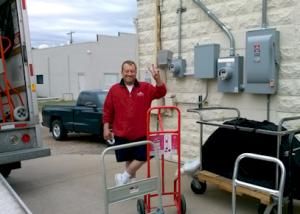 The Best Part: You will always see ME, the owner, onsite during delivery / set-up / tear-down and removal; you will not get this level of service with other providers. Thanks!